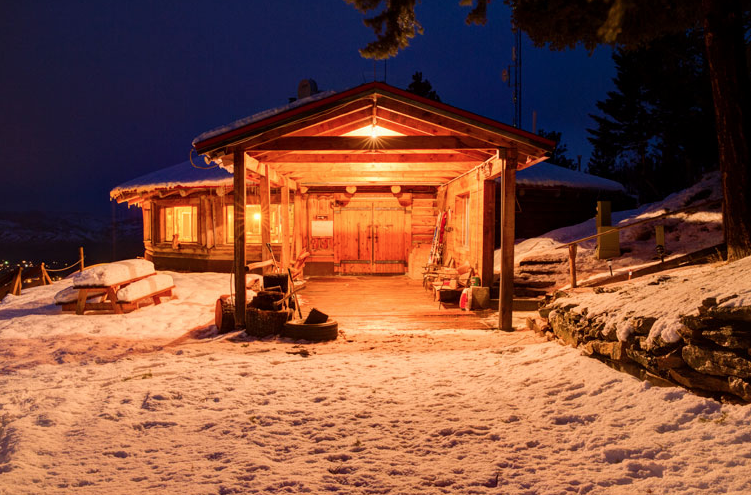 On the mountain, close to town, near the rivers, and within an hour of a multitude of trailheads, the Downing Mountain Lodge is a three bedroom, two bathroom log chalet built in the round with sixteen sides. The cozy home has all the amenities and is hands down the most private and amazing location on 80 acres of open forest land and wildflower fields adjacent to the Bitterroot National Forest. 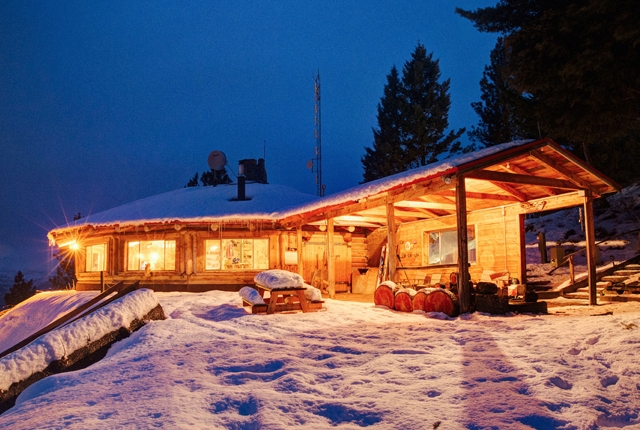 Located near hiking, fishing, boating, skiing, biking, climbing, and at the end of a private mountain road, the lodge is as private as you can get while still being close to town. With panoramic vistas out of all windows from South, East to North, the mountain house is located two thousand feet above the Bitterroot Valley with amazing Mountain and Valley views and during May and June, the lands are covered in wildflowers. We are only a fifteen minute drive to the Bitterroot River and Hamilton, the Bitterroot Valley's largest town with plenty of dining, shopping, and entertainment options. 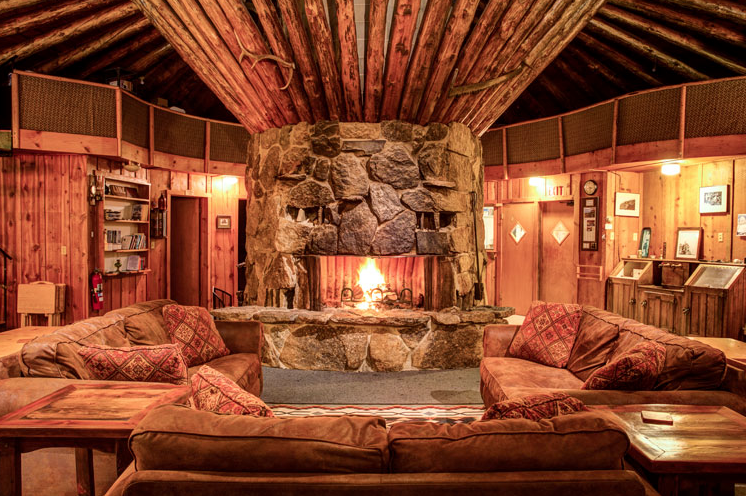 A massive central fireplace supports the log rafters and provides the authentic ambiance of a mountain lodge living room. The lodge is a single story allowing handicap and elderly access to the entire lodge and entryway deck. The master bedroom faces east and catches the sunrise. 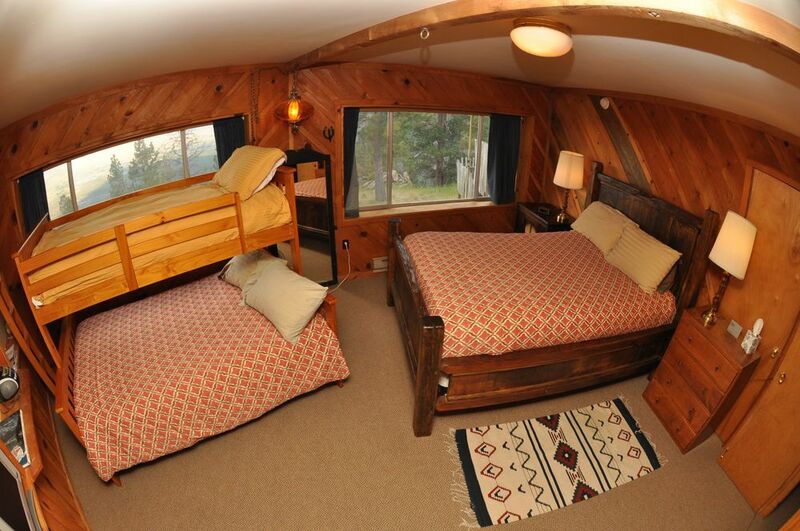 With a queen bed and twin over full bunkbed, this room can accommodate up to five. The second bedroom contains another double bed and can accommodate up to two guests. The third bedroom contains a twin over twin bunkbed as well as a twin over double bunkbed in addition to a single bed and can accommodate up to six guests. There is also a pull out Queen couch in the living room and a child's crib in the Master Bedroom. In the summer season bedding is provided. In the winter season, due to our remote location, guests are asked to bring their own bedding or sleeping bags and we will provide top sheets, pillows and pillow cases. The two bathrooms are newly remodeled. 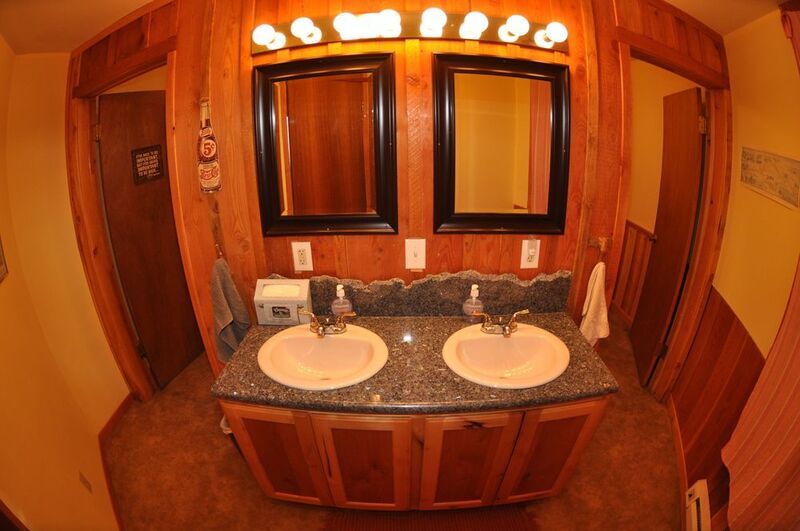 There is a vanity entryway to the bathrooms with two sinks. There is a shower bath and two toilets. The living room has three couches by the fireplace, a piano, a guitar, a large dining table for up to twelve people, and a few smaller tables, a foosball table, a board games table, and a woodstove. The kitchen is a full commercial setup with a gas range, four burner top and two ovens, a separate griddle top, and a charbroiler grill with a large venting hood. 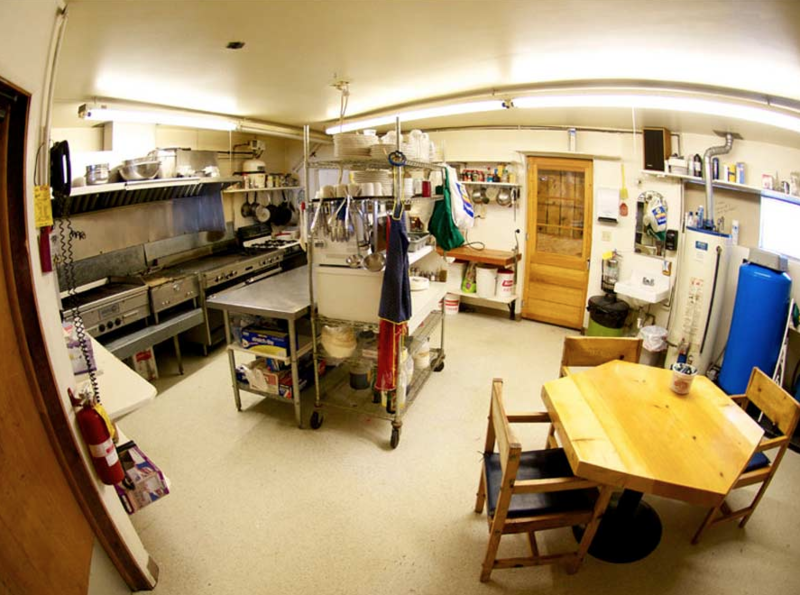 A double commercial sink, commercial dishwasher, and a freezer over fridge rounds out the essentials with plenty of room and tables for prep work and a sitting table for six. With plenty of tableware, silverware, and kitchen appliances including a toaster, microwave, crock pots and mixer, our guests or caterer is setup to prepare the most audacious of feasts. An access door to the outside and the hot tub deck is located in the west wall of the kitchen which is in the southwest quadrant of the building. Outside, via the kitchen access, is a wood stove sauna and on the south deck is a 6 person hot tub. On the front lawn is another 6 person hot tub. On the spacious east deck is a large charcoal or wood fired barbecue with a picnic table. In the covered entryway there is patio seating, a propane barbecue, and a love seat swing adjacent to a small lawn. Up the mountain behind the lodge is a dirt road leading to the northwest and a spring creek, a ridge and the trail to Downing Mountain and the high mountain tarns 2,000 feet above, and to the south after a short climb a descending old two track roadway to Owings Creek where it springs from the Earth. Wildflowers abound in May and June, July is huckleberry season, and August the weather is generally very stable high pressure. Please email downingmountain@gmail.com or call 406-531-1486 for John or 406-531-1478 for Jennifer to make your reservation. Please include a contact phone number. Feel free to call anytime. Our rates vary with the season and from weekdays to weekends, from $50-$80 per person with a four person payment minimum in the summer to a nine person minimum on prime time ski weekends alternating with hostel style during the weekdays unless an 8 person group books an exclusive stay. 7% lodging tax will be added to all overnight stays. Rules like these are meant to be flexible so get in touch and let us know your needs, we are happy to try to accommodate folks in a variety of financial circumstances. Guided ski tours are available with our Special Use Permit under authorization from the Bitterroot National Forest. To best maximize your experience and understanding of the terrain, hire John Lehrman as your ski guide and enjoy the best that Dowining Mountain has to offer on any given day. John has 15 years experience skiing at Downing Mountain and 20 years experience skiing in the Bitterroot Range. John is P.S.I.A certified Level 2 as a backcountry ski guide and holds level 3 avalanche certification from A.A.I, is a Wilderness First Responder and will be sure to provide you with an exceptional skiing experience from the lodge or elsewhere in the Bitterroots. $400 1-4 guests $600 5-10 guests. Guided groups are encouraged to be of similar ability so that we can best meet the needs of the entire group. Guided day ski trips and overnights are available for many locations on the Bitterroot National Forest. Backcountry skiing at Downing Mountain Lodge is reserved for lodge guests only, ensuring guests of DML total privacy on the mountain. The roadway and parking are private and only for use by guests of DML. No Day Skiing. No Snowmobiling other than for registered guests for access to lodge on the roadway, please inquire. No Snowmobiling above the lodge on the skin trail ridge excepting emergencies. Guided river and lake trips are available April-October either by canoe or raft. $150-$300. Catered meals are available and prepared from the freshest ingredients by a culinary expert. You can choose to have your entire trip catered or simply an elegant or sumptuous dinner feast. We work hard to provide an amazing dining experience and work closely with our guests to fulfill their dietary preferences. Dinners are $50 per person. Full catering is $75-$100 per person. Eight person minimum. Mail checks to Downing Mountain Lodge c/o John Lehrman 536 Blodgett Camp Rd. Hamilton Montana 59840. Prices do not include 7% Montana accommodations tax. Children under 13 FREE, 13-17 half $. 2 dog max, $25 each. Please keep dogs off furniture and beds and do not leave unattended inside lodge. 50% deposit requested to confirm any booking. All credit cards accepted. 406-531-1486 John or 406-531-1478 Jenny. -Ski Guide service, authorized under special use permit with the Bitterroot National Forest, is available for groups both at Downing Mountain as well as farther afield in the Bitteroot Range. $300-$600 depending on group size. - A 50% booking deposit is requested to secure any booking. A 7% Montana bed tax will be added to the accommodation portion of invoices. Payment in full is requested 45 days in advance of lodge arrival. -A group leader reserves the lodge and generally coordinates payment and logistics for their group. It is recommended that group leaders and participants during the winter ski season have avalanche forecasting experience and that there are members of the group with relevant wilderness first aid training. Avalanche safety equipment including shovel, beacon, probe are mandatory for all skiers and riders. We cannot accommodate day skiers without payment; skiing from Downing Mountain Lodge is reserved for lodge guests exclusively. 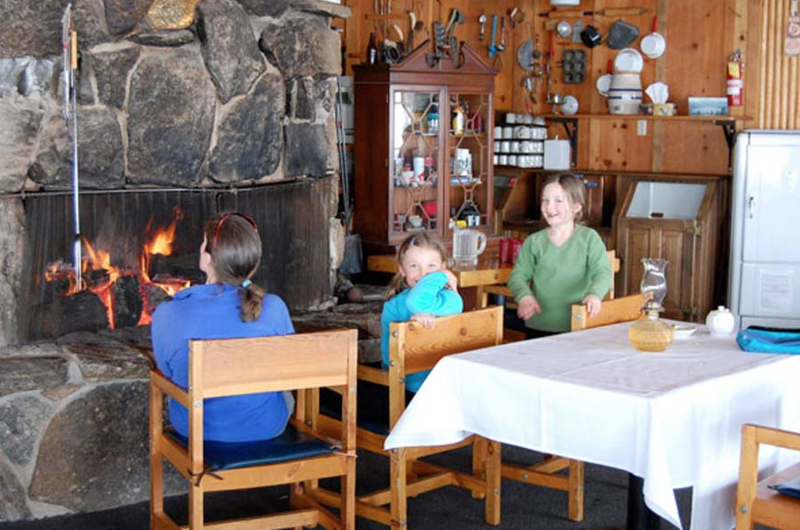 Our goal is to create a community experience for guests desiring to ski, hike and stay multiple days at Downing Mountain Lodge. -All group members will be required to read and sign a liability waiver before using the roadway or accessing and using the lodge. -During the winter season, we provide top sheets for the beds (4 twins, 4 doubles, and one queen), pillows and cases. Please bring your own blankets or sleeping bag, towels for the shower and hot tub, and preferred bath and toiletry items. -Self catered is standard. A catered food option is available and encouraged with a variety of price range and menu options to fit your budget. 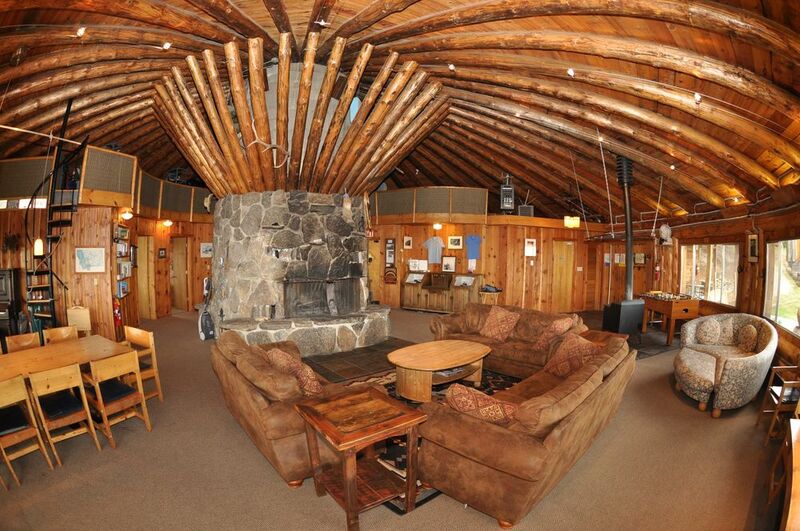 Lodge hosting is also available upon request. Call or email for details and pricing. -During the winter months, snowmobile shuttles for luggage and food are available for $150 from Switchback 11 parking to lodge, 1.5 miles and 750' vertical. A snowmobile load is about 250 lbs and 16 cubic feet. $200 per load from Hamilton to the lodge via truck and snowmobile for folks without AWD vehicles or chains. Extensions available to the Missoula airport. We recommend packing in duffels, ski packs, and cardboard food boxes if requiring a shuttle. Plan to bring all your own condiments, spices and cooking ingredients as supplies are limited at the lodge. -Parking is available for multiple vehicles at Switchback 11 on the Grubstake Road during the winter months. Winter tires and 4 wheel drive are always recommended as are the availability of tire chains. Ice cleats for shoes are also recommended as the parking area often has icy patches. Parking for carpooling is available in Hamilton behind the main street Post Office. -For inbound and outbound travelers we have a pull sled available for hauling trash, luggage, and extra food. Please secure to avoid wind loss and contact for availability. -We do occasionally book multiple parties, hostel-style during the winter ski season, if not an exclusive booking. -Families are encouraged; children under 13 are free. -Well-behaved, trained dogs are welcome for $25 per dog with a maximum of two dogs per group. Dogs must not be left alone at the lodge. Owners are expected to remove dog excrement from around the lodge area. -Cancellation policy: if cancellation is within 60 days of trip a full refund of deposit and payment will be issued by check if your space can be filled. Trip cancellation insurance is widely available from various companies.